I-SITE recently joined the movement to make schools a healthier place with the design and development of a new website. 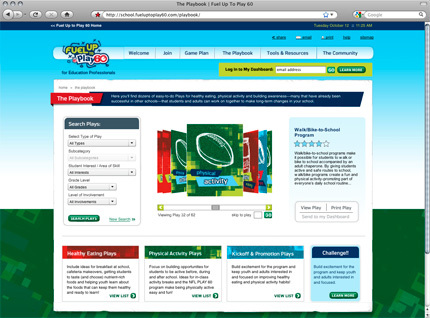 With over 60,000 schools now enrolled across the USA, thousands of educators are signing up at the new website to access activities, tools and resources that help their students to Fuel Up to Play 60. Once registered adults can track the progress of their schools and students through personalized dashboards and by following six clear steps for the program. To motivate educators and students the site includes digital rewards that can be downloaded once certain tasks have been completed. I-SITE collaborated with teams from National Dairy Council, Edelman and MMS Education on the project. The site launched September 1.